Manuel Pellegrini aimed a jibe at Jurgen Klopp saying the Liverpool boss is “used to offside goals” after their controversial opener in Monday’s 1-1 draw at West Ham. Liverpool took the lead courtesy of Sadio Mane’s turn and shot from James Milner’s cross on Monday night, although the latter was a couple yards offside when he received the ball before delivering the assist. 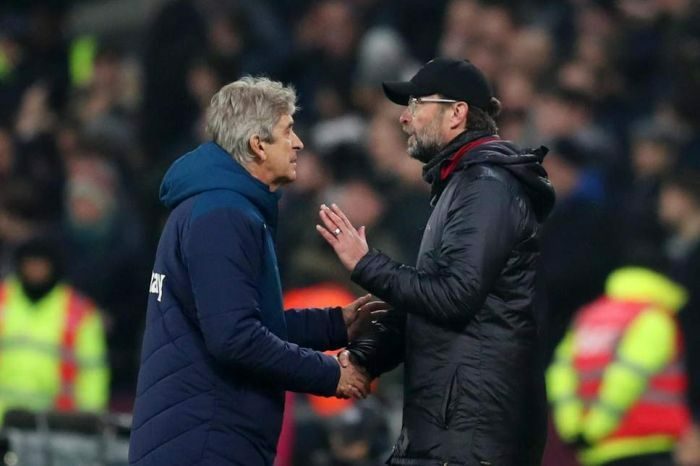 At full-time the two exchanged heated words and in his press conference Pellegrini said any complaints Klopp had about the game were invalid, after the Liverpool boss had ranted at referee Kevin Friend as the teams headed off at the end of the game and later questioned the ‘strange’ decisions during the match. He also made reference to a goal scored by Borussia Dortmund, then managed by Klopp, against his Malaga side in the 2012/13 Champions League which out knocked the Spanish club, but should have been ruled out for multiple offside infringements. “Klopp is used to winning goals offside. He beat me against Malaga with Borussia Dortmund with a goal seven metres offside so he cannot complain about nothing. “They have the two clear chances offside and they score one goal, so as I said last week we attack and defend very bad, tonight we did all very well and I think we deserve to win so that is why I am not happy with a point. “I said in the press conference before the game that every game is different, you must play and it doesn’t matter if you play against the league leaders at this moment, the best defence in the Premier League and with an attack that scores a lot of goals.